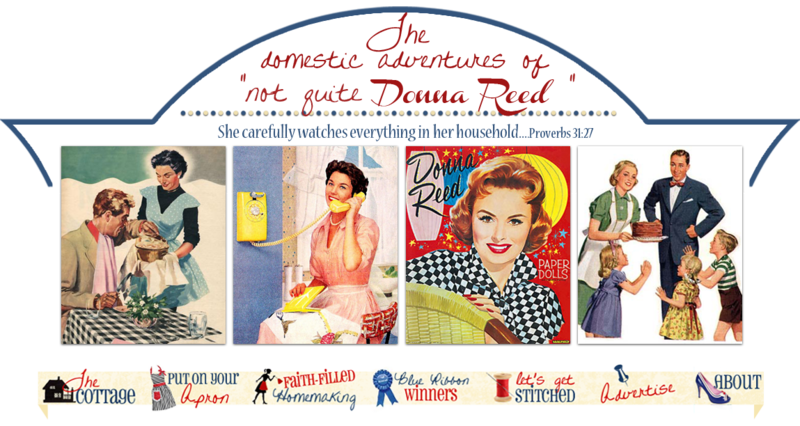 Not Quite Donna Reed: NATURE STUDY WITH CHARLOTTE MASON AND A GIVEAWAY! NATURE STUDY WITH CHARLOTTE MASON AND A GIVEAWAY! The Summer Solstice has ushered in some lovely weather here in New England. Perfect for a bit of summer nature study. I have no agenda whatsoever in regards to the natural world and the observance of it. What I do is simply supply plenty of heavy drawing and watercolor paper, paints, colored pencils and a selection of journals and nature themed books. Most times these items are just haphazardly left on the end of the old pine farm table, other times left outside on the decking where a child, or myself, can quickly grab paper and pencil and sketch at a moments whim. Most days, visitors of the natural world present themselves unannounced and our inclination is to run and grab binoculars, camera or sketching materials, often startling our visitors into flight! This is why I keep these things within reach and handy, to allow for a gentler retrieval of the needed items, thus allowing our visitors to linger undisturbed so we may capture their beauty. A bit of "messiness" is worth it to further the observation of our natural world. Below is some pictures my husband captured of one such visitor to our cottage. 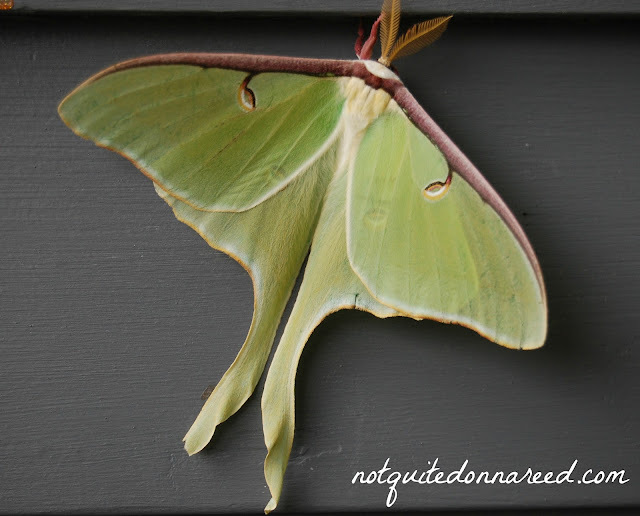 This luna moth visited most of the day while we went about our outside activities. I think he felt quite at home. At the end of this post is a giveaway so make sure you get to the bottom of the post to enter! The delicate, exquisite green of the luna's wings is set off by the rose-purple, velvet border of the front wings, and the white fur on the body and inner edge of the hind wings. Little wonder that it has been called "The Empress of the Night". The long swallow tail of the hind wings gives the moth a most graceful shape, and at the same time probably affords it protection from observation. 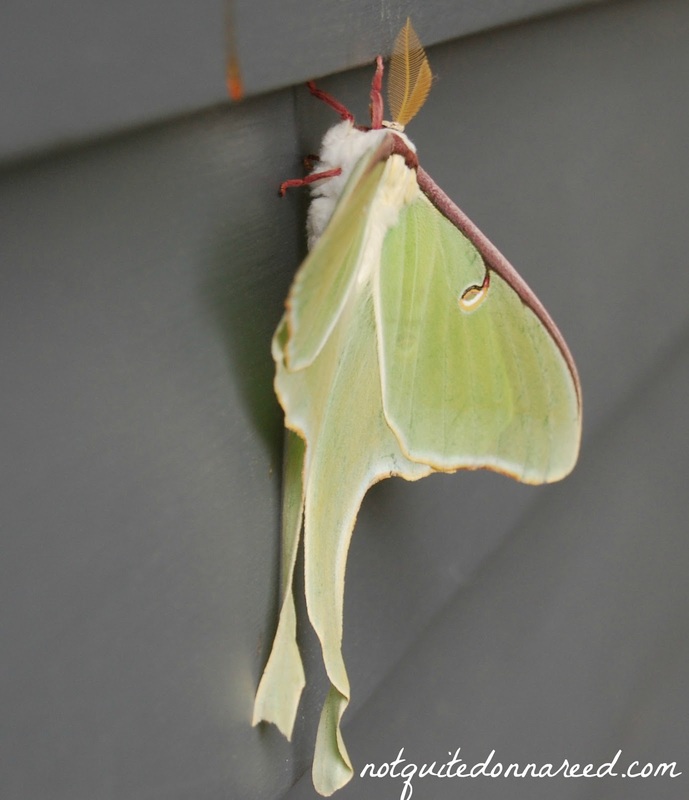 During the daytime the moth hangs, wings down, beneath the green leaves, and these long protections of the hind wings folded together resemble a petiole, making the insect look very much like a large leaf. I have an extra copy of Anna Botsford Comstock's classic book, Handbook of Nature Study that I would love to give to another nature study enthusiast. Just leave a comment telling me what how you incorporate nature study into your seasons and your entered. Comments will close Friday, June 29th, and the winner will be announced within this post. I incorporated it a lot more this time around because I finally got my boyfriend into it. Ever since we spent a few weeks last Fall in the Rockys hes been even more fascinated about Nature in general, so he's taking to this quite enthusiastically! I LOVE the luna moth. It is magnificent! We have both formal "nature study" times when I purposefully pack up a few guide books and our sketch books and drawing supplies and we head out to learn about a particular subject. But more often than not we have informal study when one of the children finds something they think is interesting while playing outside and one of them comes running for a guide book and my camera! We try to take lots of pictures that way if what ever they are looking at decides to make a break for it, we still have a picture to look at for reference while we draw it in our nature notebooks. I have had the Handbook of Nature Study on my homeschool book wish list for two years now... I am very excited about this great giveaway! Thank you! Suzanne, I already own a copy, but wanted to tell you that the photographs of the moth are lovely. I've never seen a close-up of the underside. It looks so soft. I have enjoyed perusing and searching for particular topics in the book over the years. Someone will be greatly aided by your gift. 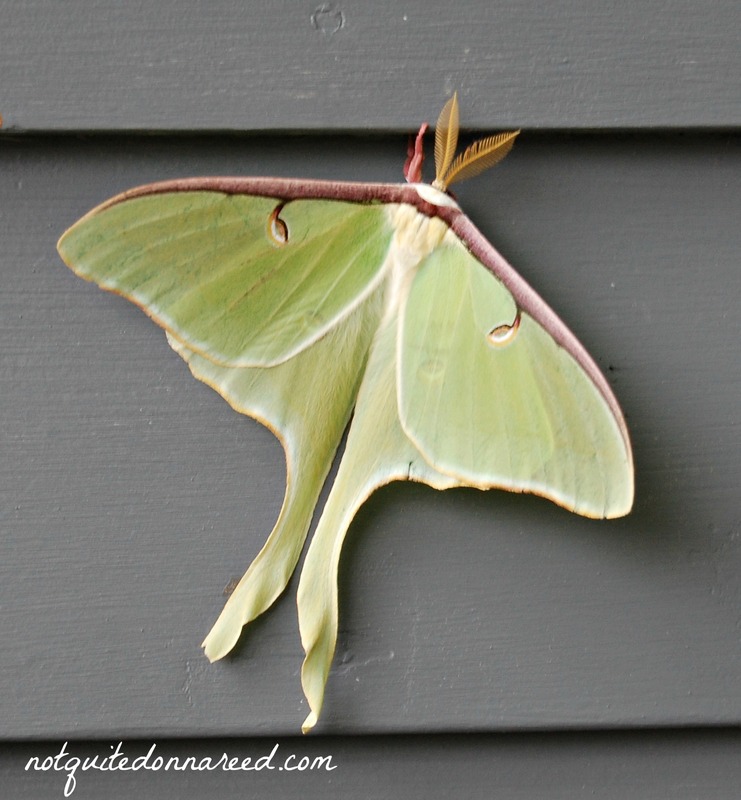 Those are lovely pictures of the luna moth. We had one visit for several days on a cedar tree. I so enjoyed getting a close look at him or her. Hmmmm...I need to look for photos of male and female luna moths. Nature study is a passion of mine. I particularly love all insects and bugs and spend a great deal of time talking to anyone who will tolerate my ramblings about them. Friends bring me dead bugs and I keep each one in its own special box. What fun to find or make a box just to hold these wonderful creatures. I don't allow folks to kill insects or bugs just so I can have them, but it's amazing how quickly people can turn from being disgusted at the sight of a bug whenever they see how fascinating it can be. I always make a point of explaining what kind of bug or insect they've brought and how its protective coloration or long legs, or big pincers, etc. enable it to survive, or some other fact that would endear it to the giver. Every season produces such wonderous creatures if a person will just stop to notice. I've been known to uncover rocks in the winter just to see what little creature has managed to find itself a snug little place to pass the time until spring. I would be ever so grateful if I could be the lucky recepient of the Handbook you're so graciously offering. The random number generator picked you! You didn't have a blog that I could visit so I hope you pop back in her to check. Just email me at notquitedonnareed@gmail.com and I will put your book in the post. This fall will be my first time homeschooling. My son will be going into 3rd grade and I am bringing him home to learn with me. He is a typical boy, so loves being outdoors and exploring. We will use this book to explore his Father's world and probably incorporate it into writing, art and science. Hi Suzanne, you might want to edit your post to actually include the winner's name at the bottom of the post. Since that is where most people look when it is stated that the winner will be announced within a post. The lady who won might not think to look at the comments... just a thought. Thanks for catching that Rachel! I am asleep at the helm...LOL! I just emailed you with my address and I want to thank you again for your generous present. I am honored to be the winner! My grandchildren (all seven of them) will love having Nana share this book with them. Five of them are homeschooled - actually four, now that Joseph has finished his first year of college. He was homeschooled from the beginning of his schooling. What an absolutely wonderful present...wish you were here for me to give you a great big hug!